Can you believe that as of today Disney’s Lilo & Stitch is now 17 years old? This has to be one of my favorite Disney movies, since it is not only fun and funky, and has the awesome setting of Hawaii, but it also touched upon such a unique sister relationship. Lilo & Stitch is definitely a movie to be celebrated, and to do so I made another signature Disney-inspired smoothie bowl! 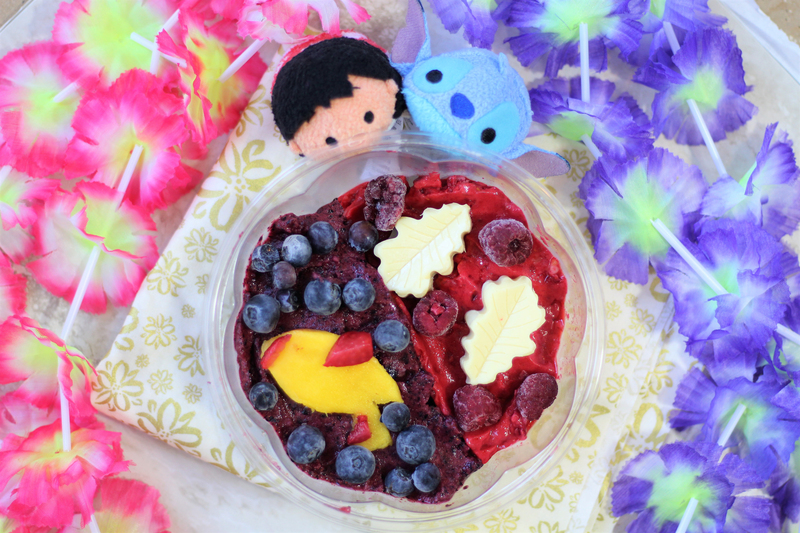 This Lilo & Stitch smoothie bowl is vegan and filled with summer fruits! Melt white chocolate chips and oil by heating in the microwaves for 30 seconds. Stir, and place in leaf candy molds, then place in the fridge for 15 minutes. Using your mango, cut a shape to look like Stitch’s blaster. Cut pieces of strawberry to look like the red accents on his blaster. In a blender (I used my Ninja Bullet), combine the Lilo ingredients: Pineapple, milk, and raspberries. Pour into a bowl, making sure to keep half of the bowl open. Blend the Stitch smoothie bowl ingredients together: Pineapple, blueberries, and milk. Pour in the other half of your bowl. On the Stitch side, decorate with the mango and strawberry blaster and frozen blueberries. For the Lilo side, decorate with frozen raspberries and white chocolate leaves. Using your mango, cut a shape to look like Stitch's blaster. Cut pieces of strawberry to look like the red accents on his blaster.